The 3/4 in. Shark Bite x 3/4 in. Female Pipe Thread Ball Valve is the easiest way to install a new or replacement shut-off ball valve. The single lever control allows for easy operation and the valve is perfect for potable water and hydronic applications where a shut-off is needed. Shark Bite fittings allow you to join copper, CPVC or PEX pipe in any combination with no soldering, clamps, unions or glue. Just insert the pipe and the stainless steel teeth bite down and grip tight, while a specially formulated O-ring compresses to create a perfect seal. Disassembly is just as fast using the simple disconnect tool so fittings and valves can be easily changed and reused. They can even be rotated after assembly for easier installation in tight spaces. Get Shark Bite and get a grip on your next plumbing project. 4 inch FPT white PVC Molded-in-Place ball valve. Large port allows maximum flow and minimum pressure drop or turbulence. This ball valve is made up of a white PVC body, that is suitable for both schedule 40 and schedule 80 pipe, with a black ABS handle. JAG Plumbing Canada is pleased to distribute the high quality Ball Valves by Boshart Industries to on line customers across North America. 4 inch Slip compact white PVC Molded-in-Place ball valve. Large port allows maximum flow and minimum pressure drop or turbulence. This ball valve is made up of a white PVC body, that is suitable for both schedule 40 and schedule 80 pipe, with a black ABS handle. JAG Plumbing Canada is pleased to distribute the high quality Ball Valves by Boshart Industries to on line customers across North America. Sb Ball Valve 3/4 Inch Sb X 3/4 Fnpt The 3/4 in. Shark Bite x 3/4 in. Female Pipe Thread Ball Valve is the easiest way to install a new or replacement shut-off ball valve. The single lever control allows for easy operation and the valve is perfect for potable water and hydronic applications where a shut-off is needed. Shark Bite fittings allow you to join copper, CPVC or PEX pipe in any combination with no soldering, clamps, unions or glue. Just insert the pipe and the stainless steel teeth bite down and grip tight, while a specially formulated O-ring compresses to create a perfect seal. Disassembly is just as fast using the simple disconnect tool so fittings and valves can be easily changed and reused. They can even be rotated after assembly for easier installation in tight spaces. Get Shark Bite and get a grip on your next plumbing project. 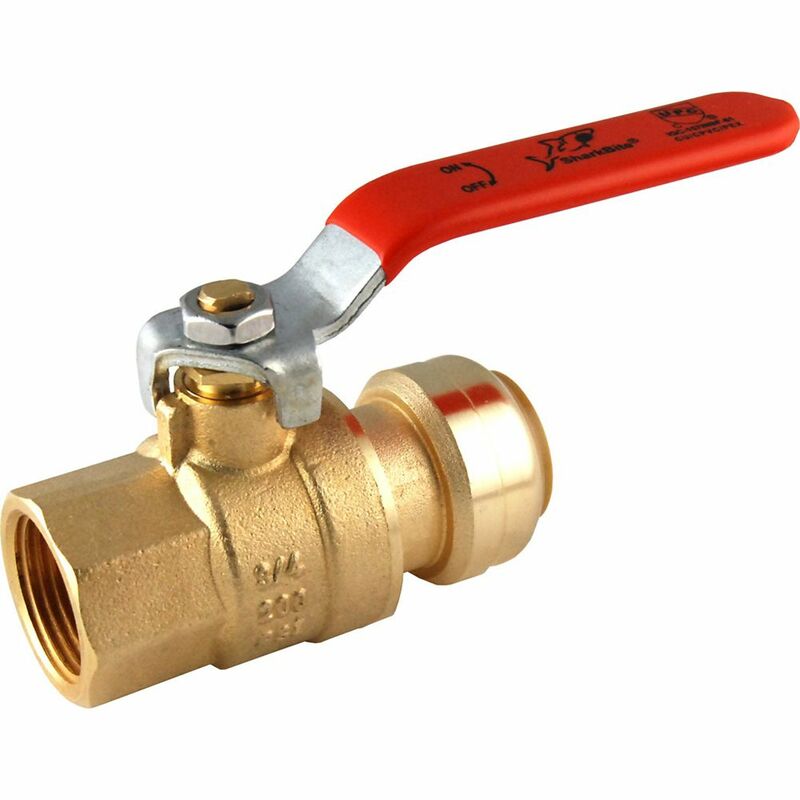 Sb Ball Valve 3/4 Inch Sb X 3/4 Fnpt is rated 4.4 out of 5 by 28. Rated 5 out of 5 by Kate7727 from SharkBite products are made by Wizards. They work by magic. Just make sure the cut PEX pipe is s... SharkBite products are made by Wizards. They work by magic. Just make sure the cut PEX pipe is square and burr free. Then they snap together like Legos. Magic Legos. Rated 5 out of 5 by JM from Great no solder solution for piping. Great no solder solution for piping. Rated 5 out of 5 by Ryan from From this point on I will only purchase Shark Bite... From this point on I will only purchase Shark Bite PEX valves. These are super easy to use and do not require a torch. Rated 5 out of 5 by JerryS1 from SharkBites are the way to go if you are using... SharkBites are the way to go if you are using CPYC piping. Much simpler and faster for DIY projects.